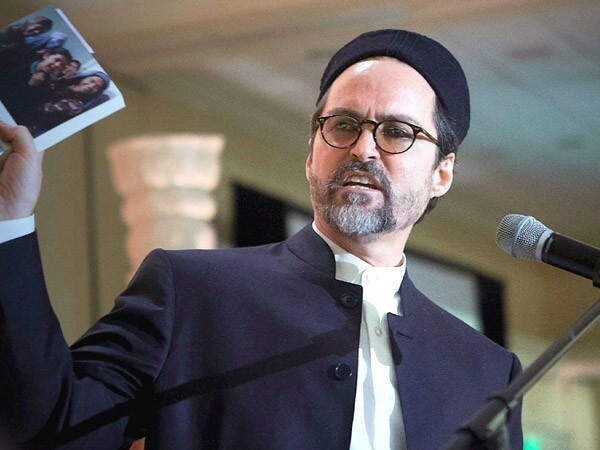 SEVERSON: Sheikh Hamza Yusuf grew up in California with a Roman Catholic father and a Greek Orthodox mother. He was taught to be a seeker and converted to Islam as a young man who then journeyed to the Middle East to study under some of the world’s top Islamic scholars. SHEIKH YUSUF: By and large most people are completely in the dark about the incredible impact that Islamic civilization had, not just on the sciences but also on theology. St. Thomas Aquinas was very heavily influence by Averroes of Spain. SEVERSON: Integrating Islam and Western culture is a notion students like Aisha Ibrahim find very appealing. 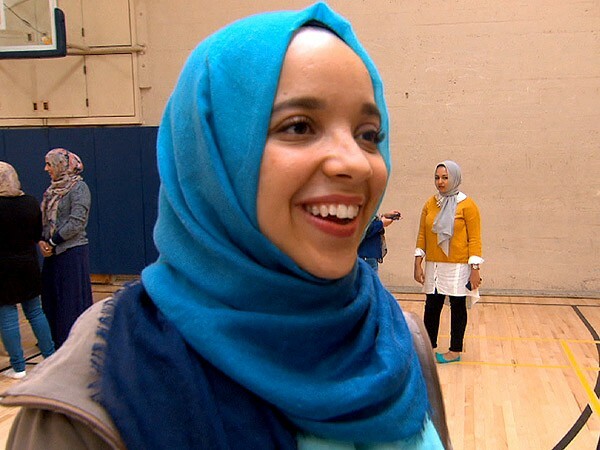 She graduated from high school in Chicago one day and rushed out here the next day to begin studies at Zaytuna. AISHA IBRAHIM (Student, Junior Class): For us it’s very important to hold onto our faith and to do that in a space where it’s encouraged, to engage your intellect but also to remember it goes with your faith, and they are not separate. SEVERSON: Mahan Mirza is the dean of faculty at Zaytuna. PROFESSOR MARK DELP: It’s one of the best places that I’ve ever taught. 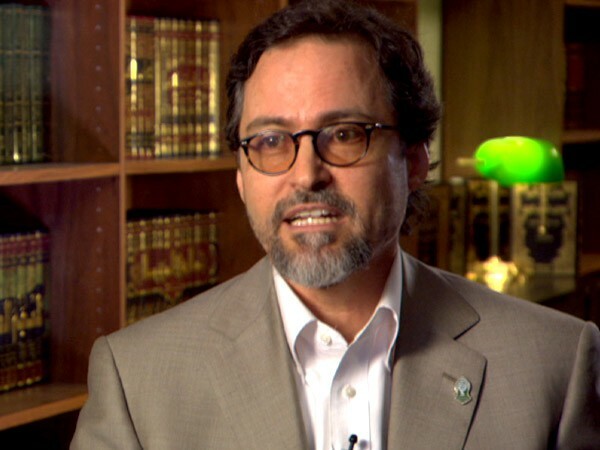 SEVERSON: Professor Mark Delp is the only non-Muslim on Zaytuna’s faculty. He teaches philosophy and logic. PROFESSOR DELP: They look at education as a process of attaining wisdom. So the real interesting thing which makes it like the Dominicans, in a way, is that they look at this as their spiritual formation. So it’s not that they don’t worry about getting jobs, but they are, I believe, truly convinced that if they get this spiritual formation, they’ll be ready for anything. JOHN ROPOULOS (Student, Senior Class): There’s a religious motivation to study, as in studying is a form of worship, and you don’t, really find that anywhere else. Here you find that, and there’s this huge emphasis on what you’re doing is not only important to you, your relationship with God, but also to the community of Muslims. SEVERSON: John Ropoulos is a convert, has a bachelor’s degree from St. John’s, a Great Books college, and hopes to become an Islamic scholar. 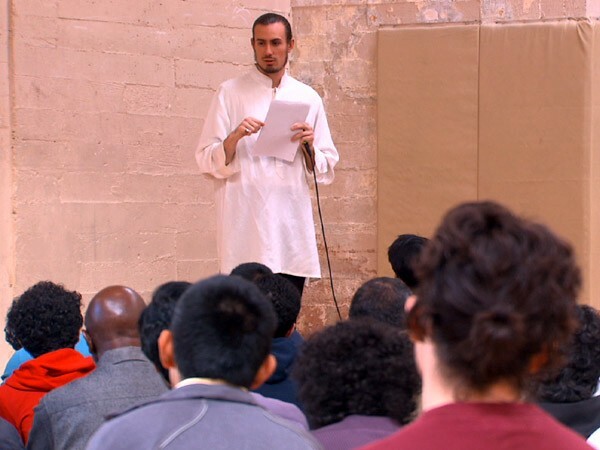 Today he’s delivering the weekly sermon at the jumah prayer service on the campus of UC Berkeley, although there’s no formal connection between the two schools. JOHN ROPOULOS (delivering sermon): One of the earliest stages of mercy for us is in our mother’s womb. That’s where Allah is forming us. SEVERSON: The Zaytuna student body is comprised of 60 students altogether. All, right now, are Muslim, although it’s not necessary. All students take the same classes, and those who graduate will have an accredited degree in Islamic law and theology. Some will go into law, scholarship, medicine, more scholarly work. What is especially evident is that the students are here to learn. 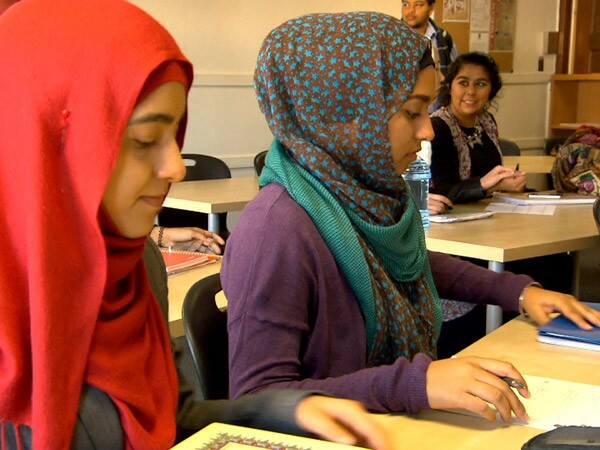 Students come to Zaytuna from a variety of backgrounds, religiously and ethnically. Some are converts. The Muslim community has contributed about $30 million to the operation of Zaytuna. Tuition is $15,000 a year plus room and board, and it’s an important school policy that students do not graduate in debt. Colleen Keyes is dean of student affairs. DEAN COLLEEN KEYES: There is no student who applies to Zaytuna who is turned away for lack of funds, if they’re qualified. So if they meet our academic standards, and there is a fit between who they are and what we offer, we fund them, and there are students—many students here are on a full ride. 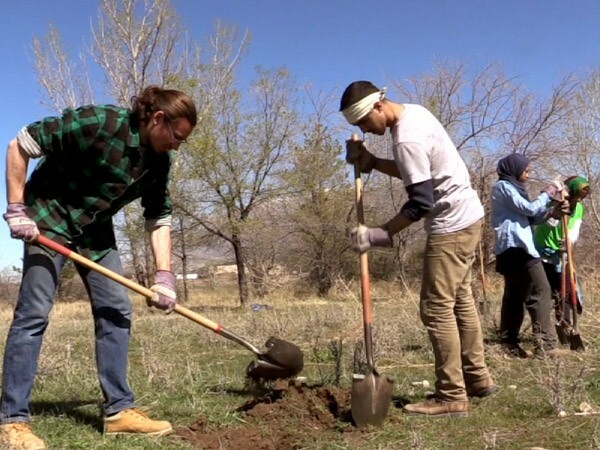 SEVERSON: It’s a requirement that all students do volunteer work in the community, like Habitat for Humanity or planting trees for the forest service. DEAN KEYES: Because our belief is that the way to serve God is through serving human beings, and that can be as a lawyer, as a journalist, as a teacher, as a doctor. But the idea that we are here to do something more than benefit ourselves is very important to Muslims. SEVERSON: Although the education is coed, there are some distinct difference between Zaytuna and secular colleges. Alcohol, for instance, is forbidden. So is dating. IBRAHIM: In school we will all study together, but, you know, it wouldn’t really be seen as appropriate if a girl and a guy were to go out by themselves off campus to study together. KEYES: Dating is forbidden because we don’t, Muslims don’t date before they marry. They have other means for determining whether they’re suited for marriage, and so dating is not allowed. SHEIKH YUSUF: We are at a particularly dark period in Islamic tradition, unfortunately, but that does not in any way dim the light of its civilization in the past. SEVERSON: Of Muslim terrorists, he says they represent religion gone bad, unfortunately, just as other religions’ extremists have gone bad over the years. SHEIKH YUSUF: One out of every four people on this planet is a Muslim. The idea that somehow some evil morality could’ve spread like that and lasted, I mean evil moralities can spread for very short periods of time, like Nazism or fascism, but they don’t last. The things that last, last because they have permanent truth in them. SEVERSON: Inside Zaytuna there is a palpable awareness that every time ISIS strikes, they will suffer, too, even though Sheikh Yusuf says they are as horrified as everyone else. SHEIKH YUSUF: We are taught always to believe that Islam is true, but to challenge our own understanding of Islam, and that’s something a lot of zealots certainly fail to do that. Their assumption is always, “I’m right. God has informed me, and this is the way it is.” And so they believe they have some kind of carte blanche. SEVERSON: Another area where the students feel stigmatized is the Western view that Muslim men mistreat and abuse women. IBRAHIM: The amount of respect that a Muslim woman will receive from another Muslim man, I mean, I wouldn’t know what I would be without that, because I feel dignified, and I try to carry myself in a way that I am respected, and Islam gives me that, and it gives me that confidence and that insurance to know that, yeah, I am in school so that I can be an intelligent Muslim woman and present the religion as it is, and not as what people may perceive it to be without actually knowing. SEVERSON: Last year, the college graduated nine students. This year they’re planning on 12. Aisha knows exactly what she wants to do when she graduates in 2017. IBRAHIM: I want to help people, and the way that I think I’m capable of doing that is going into chaplaincy. So, ideally, a Muslim chaplain in a hospital. DEAN MIRZA: If you have flowers, they will adorn any setting, every garden, every room, every table, and so we are all about growing flowers. 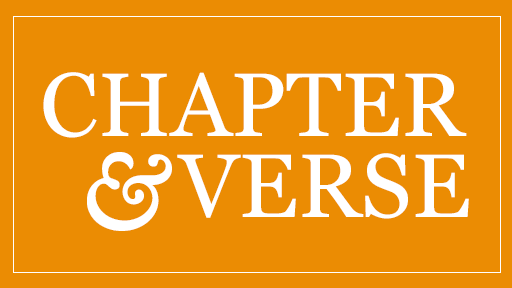 SEVERSON: For Religion & Ethics NewsWeekly, I’m Lucky Severson in Berkeley, California. R&E goes to Berkeley, California to visit Zaytuna College, the first fully accredited Muslim liberal arts college in the US. Students study great ideas from both Western and Islamic civilizations, trying to revive the historic liberal arts tradition within Islam.